That’s when something happens that provides a learning opportunity. One of those teachable opportunities for my media writing course occurred this past week — the media’s coverage of the Dove Outreach Center’s threatned burning of the Quran. This past week, we began discussing how breaking stories are covered by “print” media (i.e., local news organizations like The Gainesville Sun or The Independent Florida Alligator and national news organizations like USA Today and The New York Times). In lecture last Thursday, I used the coverage of the Dove Outreach Center and pastor Terry Jones to illustrate how the media looks for a variety of angles in covering an on-going story — from the statements of White House officials to protests in the Middle East. I encouraged the students to follow the story online on Saturday — seeing how the story evolved and comparing that to the next-day coverage of media organizations. When I made that assignment on Thursday, we didn’t know how the story would turn out. Would the burning of the Quran take place? Would Jones be persuaded not to go through with the event? Would there be violence — in Gainesville or elesewhere — in response to the burning? But the teachable moment wouldn’t just be about how the media told the story online. One of the other key issues is how the media affects the story itself through its coverage — or lack of coverage. Thankfully, because the burning of the Quran was called off, we can discuss how the story’s developments were told and the media’s role but not have to discuss the burning or resulting violence. 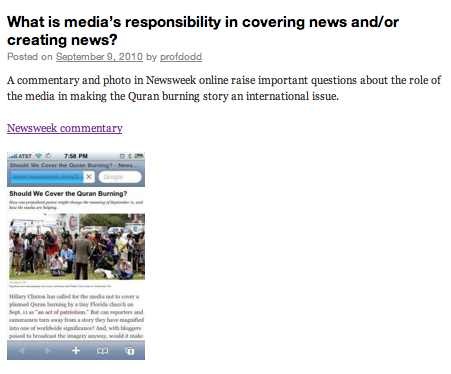 Another learning aspect about the event will be how blogs can be used to cover news and how smartphones can be used to blog, as I made several posts from my iPhone to the course blog about the canceling of the Quran burning. And that’s another helpful teachable moment, as the students will be creating their own blogs in a few weeks.